With thanks to Stephen Morris of The Workers of England Union for the video. This entry was posted in Devolution, English Rights and Parliament and tagged Campaign for an English Parliament, CEP, Eddie Bone, English Parliament, Jeremy Corbyn, Labour, Labour party, Tuition fees. have no more time for the group that calls itself ‘Campaign for an English Parliament’ than I do for Corbyn. I’m an English nationalist, and from what Eddie Bone has to say, he’s no fan of the likes of me, UKIP, etc. 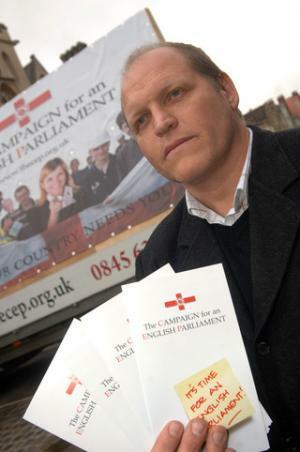 The Campaign for an English Parliament no doubt believes in the civic idea of English identity – i.e. that any race, creed and colour can adopt the English identity. Ironic, given that he accuses Corbyn of a lack of basic knowledge concerning English history. Ignoring the fact that we are a unique people with our own ethnic identity is just the sort of self-denying, self-embarrassment that is just a sop to to the ‘anti-racist’ brigade – pleading not to be regarded as nasty English racists who dare to have the affront to regard themselves as an actual people with a recognisable ethnic identity. Just as ironic is his seeming aversion to UKIP. Just what would be the point of fighting for an English parliament, only to be ruled over by the EU anyway?